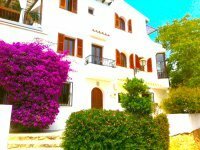 VILLAS AND APARTMENTS TO RENT IN ALTEA, SPAIN. 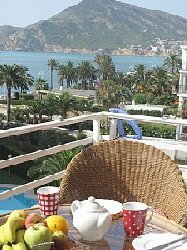 Welcome to our selection of holiday homes to rent in Altea, Spain. One of the smaller and more traditional resorts on the Costa Blanca, Altea is popular for its pleasant old town and port area and quieter beaches. Easily reached by the motorway that runs down this stretch of coast, visiting Altea is a popular day trip among tourists staying in other parts of the Costa Blanca, and makes a change from the noise and crowds of larger towns such as Benidorm and Alicante. Altea's six kilometres of coastline features a number of small beaches, usually a mix of sand and pebbles, split into coves by the high cliffs that are common on this stretch of the Costa Blanca. The two main beaches, that are closest to the town and the small port area, are Playa de la Roda, which is below the old town, and Playa de Cap Blanch, to the south of Altea. Both are very popular in the summer months, despite being more pebbles than sand, and flip flops are recommended for getting in and out of the water! Both have all the amenities you need for a day at the beach; showers, toilet blocks and snack bars. There is a pleasant promenade where there are other bars and restaurants too, and which is always busy on an evening. Just outside Altea, heading in either direction, visitors can find smaller coves which are usually quieter. These tend to be pebble beaches too and some have been set aside for nudists, so make sure you check with the tourist office if you are planning on exploring some of these coves. At the northern end of the town if the Playa de Cap Negret and a small cove called Cala de Soio, which is famous for its distinctive black pebbles. Altea is one of the more traditional resorts on the Costa del Sol, which has not succumbed to high-rise developments and hundreds of hotels. It still has a very Spanish feel and the old port is still used by local fishermen as well as by tourists mooring their yachts. Walking round the narrow streets of the old town is a pleasant way to spend an afternoon, or you can drive up into the hills behind the coast and visit some of the even smaller villages found in the area. One of the most interesting is La Nucia, which not only offers a great view over Altea and the coast, but also has a large Sunday market where you can buy local crafts and produce. Looking for self catering holiday accommodation in Altea? Then below is a selection of apartments in Altea and villas in Altea that can be rented direct from their owners. You can either click on each listing for further details or you can use our search engine on the left if you are looking for something in particular.